talking, I spotted a critter to my left near a tree. I quietly drew the attention of the other Campfire Girls to the critter. He was about 10 feet from us at that point. As we watched him, he made a large circle around all of us, then went under her deck. She said "All the critters go under there." We didn't see him again. With a big sigh of relief we went back to talking and eating. Strangely he didn't mind us walking on the deck. 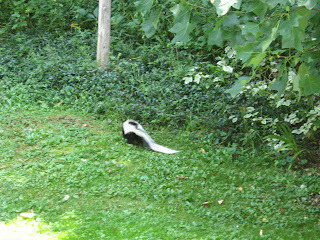 The last time we were up there this fall she mentioned she thought the skunk was under her deck again. It's snowing again today. The wind seems to be blowing the snow around as it falls. Plow trucks are out, spreading salt on the roads. This is a day to be at home baking and sewing. My Kolachki dough is mixed and in the refrigerator. This year I can't find jarred mincemeat in the local stores. My mincemeat cookies will have to wait. Maybe I'll make another batch of Chocolate Cookies from a cake mix. So easy and quick. Drop by teaspoonsful onto an ungreased sheet. Bake in a 350 degree over for 8-10 minutes. Let cool a couple of minutes on the sheet before transferring to a rack.